Benjamin Wilson-Mayor from Clitheroe received a British Citizen Youth award (BCyA) in recognition of his inspirational work with young people last night (Thursday, 19 October). Ben received his award at a formal presentation held at the Palace of Westminster. 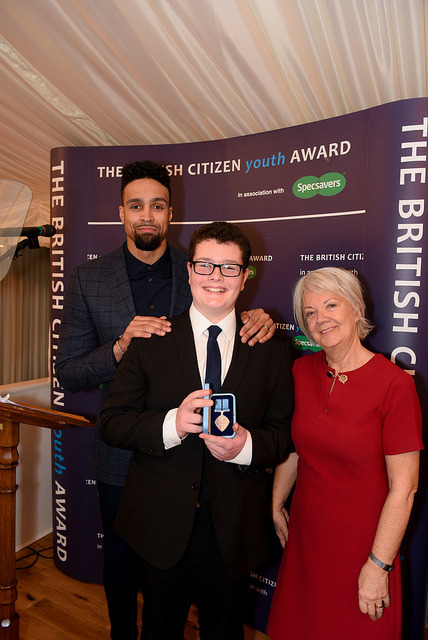 Ashley Banjo, the creative director, choreographer and lead dancer from Diversity, the group who won the third series of Britain’s Got Talent and Specsavers founder Dame Mary Perkins presented him with his BCyA medal. The British Citizen Youth Award (BCyA) recognises individuals under the age of 16 that make a positive impact on a community or society, and individuals who are role models in their communities. Recognising people who show kindness and caring to others, they enable individuals to be seen as role models to their peers, highlighting the contributions they have made. They demonstrate the positive aspects of multi-cultural communities, workplaces, community groups and charities throughout the UK. Ben, aged 13, was nominated for his work as a volunteer “reading hack” at Clitheroe library. “Reading hacks” support children on the Reading Journey, a project designed to keep children reading and entertained during the summer holiday. Ben also introduced computer coding sessions for young people and extended the digital literacy sessions on offer at the library. Through enthusiastically sharing his own skills and abilities, Ben showed commitment, versatility, maturity and cheerfulness to make an inspiring impact on both the library and his community. County Councillor Peter Buckley, Lancashire County Council’s cabinet member for community and cultural services, said: “What a fantastic way to recognise Ben’s work as a library volunteer. “Not only has he introduced beginners’ coding sessions for young people, but he went on to extend the digital literacy sessions. His work gave people the opportunity to learn valuable new skills, in learning how computers and computer programming works, and actually inspiring them to use this knowledge in a way that is meaningful to them. By helping young people to engage with IT, Ben is expanding their career opportunities in an increasingly digital world. “Ben is currently continuing to build on these beginners’ sessions, aiming to introduce new digital skills, and looking at new hardware technologies to see how they might be used in libraries. In doing so he is preparing the young people of Clitheroe to flourish in the future. Ben said: “Receiving this award is amazing. My mum told me that she felt really proud. I felt quite emotional and nervous at the ceremony, but now I can’t wait to show the medal to my family and friends.